Tis the season for graduations! Which means graduation gifts. I like buying for grads because I find them easier to buy for than a lot of other folks in my life – maybe it’s just because the younger you are, the less stuff you tend to have already acquired. I know that when I was younger I would have loved to have received an LG Microwave + Pizza Oven – heck, I’d love to receive one now! Since I already have one, I can attest to the fact that the Keurig Elite Single-Serve Brewer is the awesomest of awesome gifts for the coffee-drinker in your life. Both of these are great for a high-school grad about to move into a dorm room or a college grad ready to move up into the working world. When in doubt, you can’t go wrong with a gift card – a $50 iTunes gift card makes a great gift for the music lover in your life (and you can use it to get apps, movies and tv shows, as well!). But if I had to choose just one perfect gift for the moving-out grad in my life, I think an HP Envy 4500 printer would be ideal. It’s the best combination of practical/cool for new grads setting up their own residences. It’s pretty much impossible to get by without a printer these days, and the fact that most new printers come with copying and scanning abilities makes them even more useful. A good printer is a must when you’re applying for jobs – even in our electronic age, it’s always a good idea to show up at a job interview with a printed copy of your resume! The fact that the printer is wireless is just another plus – not to have to deal with all of those cables and wires in a small apartment or dorm room is a real boon. Whatever gift you choose for the moving-out grad in your life, know that as long as you’re within driving distance and you have a free washer and dryer for them to use, they’ll never really be totally gone! 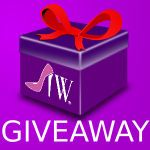 Feel free to join one or both of these parties for a chance to receive Best Buy gift cards and other great prizes. 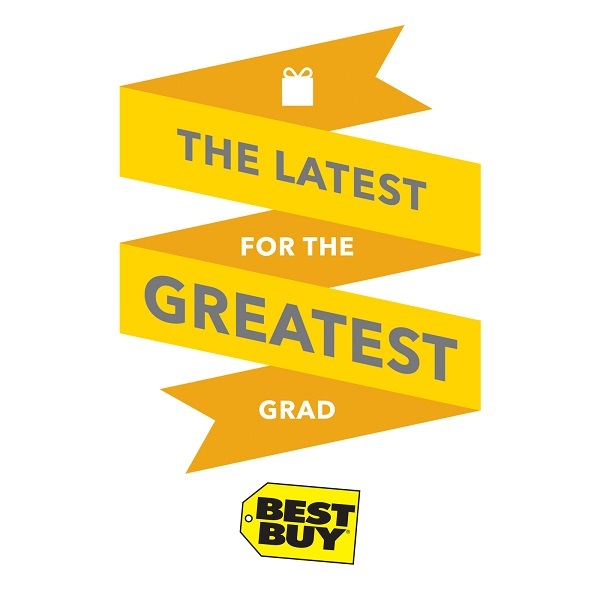 Tweet #GreatestGrad with your favorite Grad’s Gift ideas from Best Buy. I told my oldest son that for graduation he is getting bars on his windows so he can not leave! Luckily I have one more year to worry about that. He would still love many of these gifts. Best Buy definitely has a lot of great gift options. I shop there for lots of occasions. I got my husband the Samsung S5 phone. And he loves it! I bet he would like the TV too! Great gift list,my kids are not at the age of graduating yet which i am happy for i do not want them to grow up just yet lol. I just love all the great ideas. Best Buy has a nice selection. Best Buy has great options for graduates these days. I think I probably would have gotten a calculator at best when I graduated! I know the grads heading to school don’t THINK they need a vacuum, but think again. It’s one of my most used items! The fridge is an excellent choice and I’d also add a microwave onto that. I know you can get that at Best Buy too! Best Buy has the BEST GIFTS! Perfect for all occasions! Great compilation! I’ve been eyeing an XBOX One system lately. Best Buy has easily become my one stop shop for gift giving. Every single time I go there I find something new that would be appropriate for at least one person in my life. I love all of the things they have for grads! We love Best Buy! And a pizza oven in a dorm room would make that a very popular room! I do not have any grads but if I did, I would go with a tablet or laptop. Best gifts for heading over to college. These are great gift ideas. When my daughter went off to college, all she wanted was Best Buy gift cards. Those are some great gift suggestions for grads. I would love all of the those gifts. Best Buy is such a great store for so many occasions. I would love an iTunes card now. And also a new printer. There are all types of gadgets a new grad could use! I would love that pizza oven. Really, you can’t go wrong with a Best Buy gift card as a gift! What a great list! I’m sure kids heading off to college need a ton of things they can get from Best Buy! These are really great ideas. Every graduate definitely needs a tablet or a laptop of some sort. 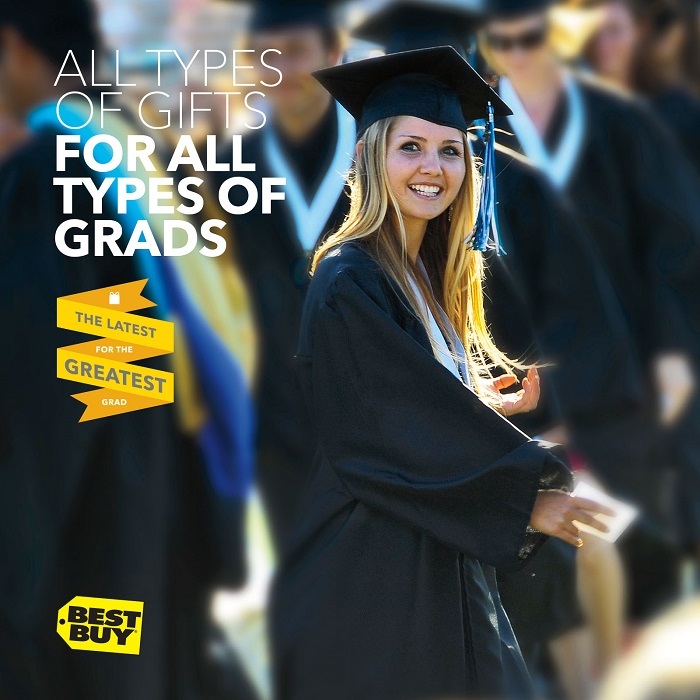 Best Buy has great gift options for all grads. I love their prices, too! I haven’t been to Best Buy in ages, but I love the amount of stuff they have. Best present as a grad for me was money, haha! Great ideas! I totally want a pizza oven! Cant go wrong with a tablet! You suggested 3 great ones so I know any grad would appreciate it! Best Buy really does have a lot of amazing gift items. I also love buying graduation gifts. Perhaps it’s because they’re beginning a new journey, and it’s fun to be part of that and help them prepare. All three of mine are done with college and on their own. Many of these gifts I have bought for them Good selection. Beets seem to be a really hot item this year and for good reason. Music is very important to teenagers and listening to music is no good if the sound isn’t right. Great list – I had a microwave and a laptop as my big gifts for graduation. I loved those items! Great gift ideas! I would love amazon fire tv! I agree with you, HP has some great printers and they are perfect for gift giving. ALL of these are great ideas and any grad would appreciate them I think. 🙂 Best Buy is a great place to shop for that special grad. Those are all great gifts any grad would love. I love best buy, I have bought my laptop, camera and more from them! Best place ever! Love the folio keyboard case! Definitely some great essentials. I recently attended a graduation party and did not know what to get. I think I may break down and buy the pizza oven! What a great idea! I don’t know any one who is graduating but I always prefer giving gift cards to older kids. That way they can decide what to get. I have a Ninja Blender and would totally recommend that for a new grad heading off to school. My son really got into making his own smoothies in high school. I wish I had some of these items when I graduated! All I got was an old fashioned paper dictionary. Oh, how times have changed! A pizza oven sounds awesome! Great gift ideas. I’d love that tablet for myself, for sure! These are great gift ideas! My daughter would really love the tablet. It would be a great way for her to stay connected to her friends and do her work on. The best gifts for grads to me right now is the Fitbit. I bought one at Best Buy last week and its perfect for tracking health and fitness and hopefully preventing the freshman 20 for those headed to college. This is a great list of gifts. Really any older kid or even adult would love these things.